Electronic Discovery or “e-Discovery” is the process of producing relevant electronically stored information (ESI) to another party in litigation. 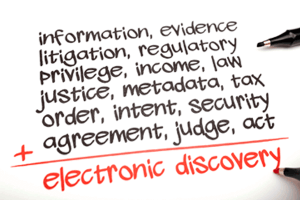 Electronic Discovery refers to any process in which electronic data is sought, located, secured and searched with the intent of using it as evidence in a legal case. • The world sends over 60 billion e-mails daily. • 90% of all documents generated today are electronic. • A single hard drive can store the equivalent of 40 million pages. The process of legal discovery has become increasingly complicated and challenging due to the advent of digital technology. Gone are the days of reading boxes and boxes of paper records in litigation. The memos and reports that once filled bankers boxes and filing cabinets have evolved into terabytes of data in electronic files in computers and exchange servers stored in the cloud, email accounts, thumb drives, compact discs (CDs / DVDs), smart phones, social media postings, as well as a myriad of other sources and devices that are all potentially “discoverable.” Because of continual advances in technology, Electronic Discovery has become a key component of the legal process. How Can CopyScan Technologies Help? CopyScan Technologies can cull the electronic data for you, dramatically improving your approach to data reduction. This supports a more effective early case assessment, and also saves your client a lot of expenses. CopyScan Technologies can process your Electronically Stored Information (ESI), whether in native format like Outlook, Word and Excel files or just plain PDFs, and create “load-ready” files for use in your review platform. Thanks to our flexible and results-driven infrastructure, no project is too big or too small. Our scalable and efficient hosting and review system, supported by our secure and confidential data center, help legal teams cull, search, redact and review documents for production. Contact CopyScan Technologies when you’re ready to explore a smart and seamless approach to e-Discovery. We welcome the opportunity to learn more about your firm and how to identify ways to support you and your client’s goals around efficiency, document security and confidentiality.